There are some days I come home so tired. That first week or two, it was every day. It's still most days. It is today, for sure. It's normal, I understand. That doesn't make it easier. Day 2: Name a Song you like with a Number in the Title. 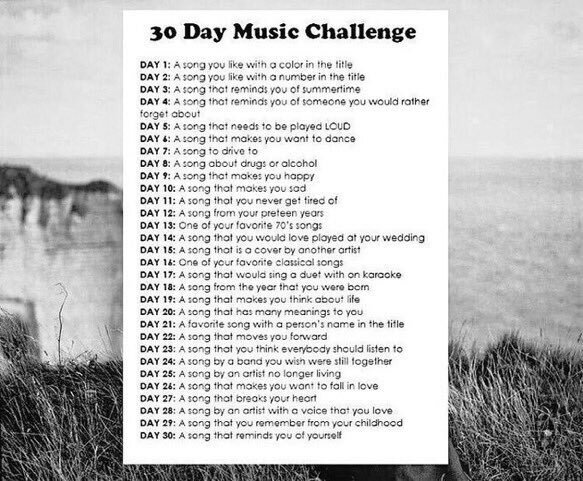 Day One: Name a song you like with a color in the title. I dreamed of Dad last night. That after his heart surgery a couple of years ago that there was actually a clone dad that had been living in his place, and that was the one that was sent back after the surgery was the one that died a few weeks ago. It's one of those things going around Ye Olde Facebooke....what's your favorite movie for each year of your life. Apologies if the blogamathing has become Big Stupid Tommy Missed His Dad, but that's what it is. I've been working like mad. Went back the Friday after the funeral. Mostly to keep my hands busy. We had a minor snow rush over the weekend (lousy Smarch Weather). It was annoying in that way that all Southern overreactions to the threat of winter weather are, but it also helped a little to get moving and put my mind somewhere else for a while. Little things hit me. I went to Target this afternoon, and I saw the Blu-Ray of the Daredevil Netflix series. I'd kinda chalked that one up as a Father's Day present for Dad. Mom and Dad's house is too far out in the woods to stream too much (although with Verizon's shift to unlimited Data, that could change though that point's moot for Dad, I reckon). Anyway, I saw the Blu Ray and I got the shivers, a bit. The NCAA Tournament starts up soon. We always watched that together. It's going to be hard without him. This morning at work, as I started checking the grocery order, I had to stop and take a few breaths. 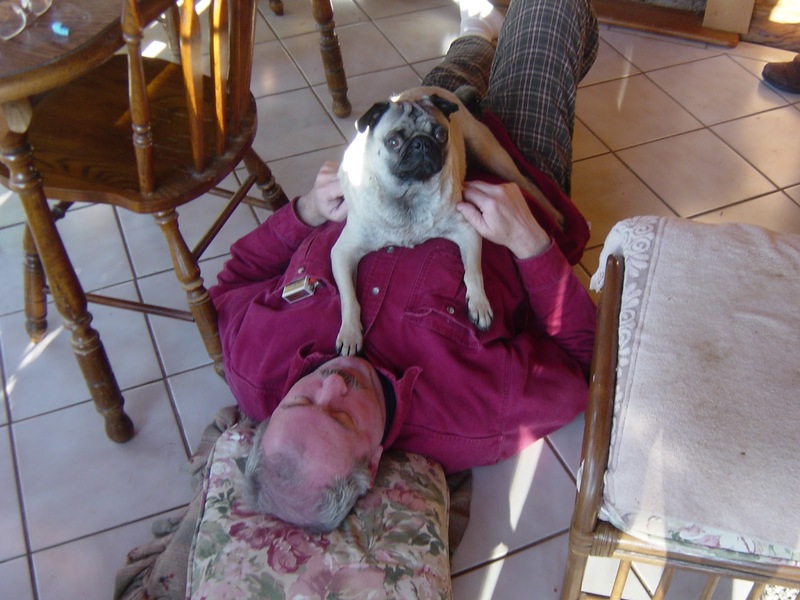 I don't even know what set it off, but that feeling of missing the old man just hit like a hammer. I call Mom a lot more. Just checking in. Seeing if she needs anything. We've got another cold snap coming through tonight. A hard freeze. Just wanted to make sure she had enough firewood. It's tough. I miss the old guy. Each day is a little different. Each day I'm dealing with a different thing. Today, I got really upset when a red truck the same make and model as my Dad's parked next to me at Lowe's. 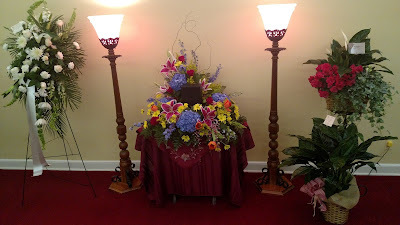 The Memorial Service was yesterday. It was a good one. Got to see a lot of people that I hadn't seen in years. Was surprised by the number of folks in my life who showed up. It was overwhelming, to be honest. We'd requested in lieu of flowers that a donation be made in his name to either E.G. Fisher Public Library here in Athens, or to the McMinn Regional Human Society. Still, my work and my sister's work sent really nice arrangments. Mom took them out to the graves of family members who'd died locally today. "Thank you. To all of you. This has been, hands down, one of the toughest weeks my family and I have ever gone through. The outpouring of support, though, has been nothing short of overwhelming. Thanks to those who were able to stop by this afternoon. Thanks to those who sent flowers, or food, or made donations to the Humane Society or the Library. Thanks if you dropped a note. Thanks for the hugs. Thanks if you made me laugh. Thanks for your thoughts, your prayers, your time. You're a good bunch of people. And I can never repay the kindness. Dad was a good guy. And that's the most gratifying thing: To hear the same from everybody. From his family. From his fraternity brothers who showed up. From the people that he worked with, traveled with. From his friends. To hear that they thought so much of the guy, calling him solid, kind, the genuine article, was an honest pleasure, though not a surprise. We'll miss him. And we step into a strange new world without him here to talk to, to laugh with. I take comfort in knowing that I have you folks to travel with us into this odd place. Thank you. From the bottom of my heart." That might be the last picture Dad and I took together. 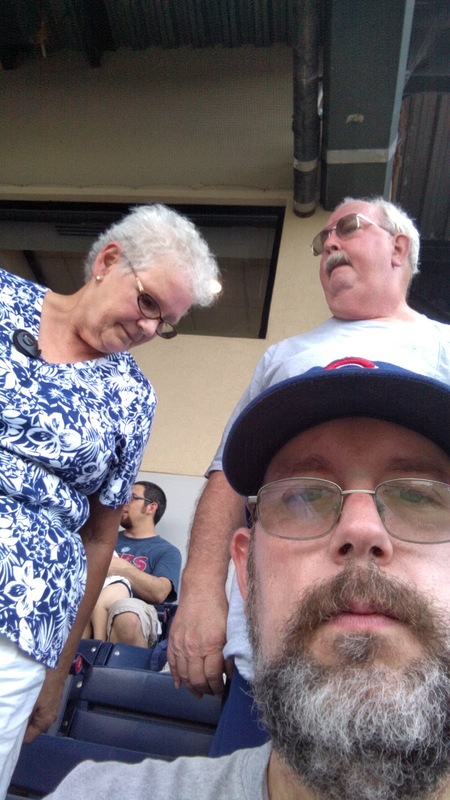 It's a selfie I took last June when the Cubs were down in Atlanta. Dad and I did a lot of baseball. He was a Braves fan. Even after they won in 1995, I'm not sure he's ever forgiven Lonnie Smith for his performance in the 1991 Series they lost to the Twins. One good way to get him riled was to say that Dale Murphy didn't belong in the Hall of Fame. He was a Cubs supporter, too. That was because of me. He always wished them well, and would cheer for them when they weren't playing the Braves. He was happy for them and me when the Cubs won the World Series last fall. He took me out of school in 1992 to see a Braves playoff game against the Pirates. He took me to Riverfront in Cincinnati in 1988 to see my first Major League game. The Cubs won that one 4-2 in 11 innings. 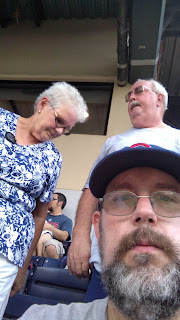 I was eating a hot dog which popped out of the bun after the first bite and rolled down three or four rows in front of us. He bought me another. We started hitting Braves games pretty regularly in 1989. It was a different world then. Those Braves were lucky to win 70 games, and you could walk up to Atlanta-Fulton County Stadium and get a whole family in for about 16 dollars. When I was going to school out in Middle Tennessee, he came out and we hit a Nashville Sounds game. It was early in the season, and it was a cool week night. There were maybe 500 people in the stands that night, and a knuckleball hurler was going for the other team. It may have been Jared Fernandez, but the answer escapes me right now. The knuckler was mostly working. There were probably 50 foul balls into the crowd that night. His birthday gift to me this year was going to be tickets to the Cubs and Braves in the new Stadium down in Atlanta this season. Little things keep hitting me. And the fact that we'll never go to another baseball game together was a big one. I was watching TV this morning, and an ad for Kong: Skull Island came on. I started crying. Dad mentioned wanting to go see it, when I saw him Friday morning. 14 hours later, he'd be dead. I got a lot of my taste from my Dad. For comedy. For Science Fiction. Mel Brooks. Star Trek. Return of the Jedi--Dad took my cousin David and Me to see this one in Bristol. We liked it so much, we'd go see it again back home in Athens--and this was a time that we didn't have a lot of money to go see movies multiple times. Secret of the Sword--I was crazy for the Masters of the Universe toys. My sister went with us to see this one, because She-Ra was in the mix. Dad hated this movie, but put up with my raving about it. After I took Thomas to see Ratchet and Clank this year, I apologized for subjecting him to so many bad movies. Rocky IV--We were visiting family in New Jersey. Dad and I went to see this one, I think, because he was worn out on the in-laws. Flight of the Navigator--Maybe the hardest I've ever seen my Dad laugh: Kevin has just asked a man for change to use the phone when he lands the spaceship outside a gas station...Max sticks his head out the hatch to insult the man. Dad nearly lost his mind. Batman--I saw Batman in the theater multiple times that summer. He went for a couple viewings. It wasn't until later that I found out he didn't like the movie that much....Thanks Dad. Fellowship of the Ring--Notable for this occurrence: In the middle of a crowded movie theater, Dad crosses his legs. When he does, a lot of change falls out of his pocket. It happens during a quiet part of the movie. Change hitting concrete. A lot of change. Like, why is Dad carrying this much change? While it's still quiet, he announces "That's Mine," as if a theater full of people is rushing beneath his legs to pick up change. Slither--I'd moved back over to East Tennessee. I was also having a very bad week--I'd worked a crazy amount of days in a row. This was my first movie I'd been to see in weeks. And a girl wouldn't get off her cell-phone. This is probably the closest I've been to getting arrested....I told the girl to turn it off. She cussed me. She got cussed back. Dad kept me from pulling the girl out of the theater by her hair that day. 2012--He LOVED disaster movies as much as I do. I probably get it from him. We'd both been looking forward to this one. It was disappointing to us both. He described it as it being Christmas all day. Star Wars: the Force Awakens--God he was excited about that one. Again, he was a little disappointed that we wouldn't get to see it together--Shyam and I went to a marathon...he was invited, but he was in the midst of his hip troubles, and he knew he couldn't sit in a movie theater seat for that long. He loved it. We took Mom to see it on Christmas Day. (I just started crying again when I realized he won't get to see how the saga will end up). The Witch -- He didn't want to see this one, but he went anyway. He ended up LOVING this movie. Patriots Day -- The last movie he and I went to see. We'd go to one or two a month. Sometimes more. This winter has been crazy, though. And we didn't make it to much. We did go see this one. I was skeptical. But it was one I ended up liking. I'm sure that there's more to be said. I'll think of something else. I miss the old man. I'm gonna miss going to movies with him. I lost my Dad last night. I've spent a lot of today in a fog. Two hours of sleep and a storm surge of grief. Thanks for the sense of humor. For the taste in movies. For teaching me how to be a decent human being.